The Osiris-Rex team was kind enough to send me a public version of a presentation describing the mission. Because this is a public version, most mission details are not included. Discovery and New Frontiers mission competitions are highly competitive, and most proposals are selected (if ever) after several submissions. (All three New Frontiers proposals this time around have been finalists in previous mission selections.) So teams keep the details close to the chest in case they have to submit again. No point to enabling the competition in a future competition. 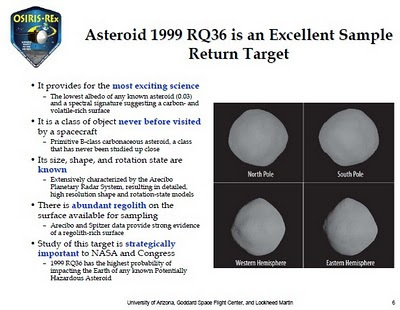 (1) The target asteroid is the same as for OSIRIS' previous incarnation as a Discovery-class mission: 1999 RQ36, a "B-class" carbonaceous asteroid made of primitive material from the Solar System's early history that has not undergone extensive heating and thus modification since it was incorporated into the original Main Belt asteroid of which RQ36 is a broken-away fragment. (2) 1999 RQ36 has several important characteristics. It's the darkest-colored asteroid yet measured (reflecting only 3% of the sunlight that hits it), which means that it must be made of particularly carbon-rich minerals exposed to minimal heating -- almost certainly including substantial amounts of fairly complex organic molecules. It has been substantially examined and mapped both by the ground-based Arecibo radar observatory and the infrared Spitzer Space Telescope -- which have provided data both on its overall size, shape and rotation, and on its overall composition (the asteroid not only has "a spectral signature suggesting a carbon- and volatile-rich surface", but apparently has a good deal of loose regolith on its surface that can be easily sampled by a spacecraft). (3) And 1999 RQ36 also happens to have "the highest probability of impacting the Earth of any known Potentially Hazardous Asteroid" -- specifically, a one-in-1800 chance of hitting Earth in 2170. OSIRIS REx, during its year or so of orbiting the asteroid before finally dipping briefly to its surface for sampling, will allow Earth tracking stations to determine the asteroid's orbit with extreme precision -- thus further allowing forecasts of the probability of its striking Earth (as well as allowing the best measurements yet of the "Yarkovsky Effect" by which the absorption and reflection of sunlight by different parts of a rotating asteroid can actually produce a faint but significant thrust that modifies its orbit). (4) OSIRIS REx is scheduled to collect and return an absolute minimum of 60 grams (about two ounces) of material from the asteroid's surface -- but it has the ability, if conditions are favorable, to return as much as two kilograms of material (about 4 1/2 pounds). It will not only map the global chemical, mineralogical and physical structure of the asteroid to put the returned sample in perspective, but will "document the texture, morphology, volatile chemistry, and spectral properties of the regolith at the sampling site in situ at scales down to the sub-millimeter" -- presumably using some instruments attached to the boom-mounted sampling device itself (which can flex like an arm to load the sample into the Earth return capsule mounted on the spacecraft's side). (5) The craft will use scanning lidar (laser radar) to steer itself to precise courses around the asteroid and down to appropriate spots on its surface, enabling it to acquire samples "with no time-critical events" -- that is, once it has descended to near the surface and matched the asteroid's rotation rate, it can collect its samples in a leisurely way according to what its navigational instruments tell it, instead of having to work against a tight time deadline. It will also provide more practice to ground controllers in carrying out such precision movements around a small body such as an asteroid or comet nucleus. 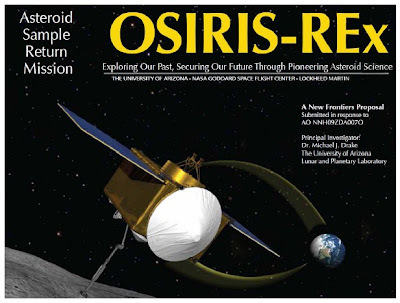 (6) OSIRIS REx is a cooperative effort by the Goddard Space Flight Center, the University of Arizona, and Lockheed Martin (which would build the craft) -- but it also includes one science instrument from Arizona State University (a thermal infrared spectrometer), and another unspecified one from the Canadian Space Agency. 1999 RQ36 may have once been a primitive body in the asteroid belt but in it's current orbit it has experienced sub-solar temperatures over 400 K (127 C, 260 F), which have roasted a good part of the surface. Most of the asteroid has likely seen temperatures over 300 K (27 C, 81 F), which means that the volatiles have likely been driven away from the near-surface layers. 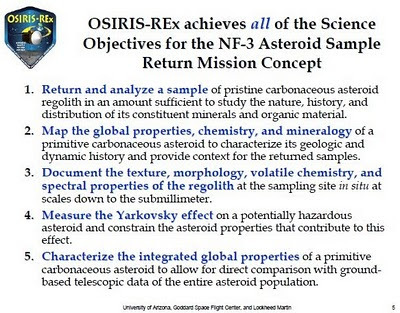 So anything that OSIRIS-REX collects is going to be substantially modified from its original primitive state (unless the spacecraft can dig deep into the surface, which I very much doubt). It's not going to tell us all that the science team claims. Moreover, it is a pretty tremendous waste of money to collect samples from an asteroid that has likely already delivered meteorites to the Earth. Sure, we'll know what asteroid the samples originated from, but we don't know where in the main belt that asteroid came from. So what's the point? Those are quite detailed comments. Thanks for sharing them. I believe that the heating of the surface of primitive bodies has been a concern for sample return missions. If anyone can shed more light on this issue, your comments would be appreciated. I really appreciate this information about The Osiris-Rex team. A Solar Powered Europa Orbiter?